The U.S. has thousands of substandard roadway curves that became more dangerous in 1996 as speed limits were increased across the nation. On average, roadway curves have five times the accident rate of straight roadways.1 And, sharper roadway curves have higher accident rates than flatter roadway curves. Now in a new millennium with rapidly expanding technology, the U.S. still employs archaic policies for signing roadway curves. These policies vary by jurisdiction from a complete lack of any applied science to the determination of the controlling design (safe) speed based on a weak premise using an inaccurate measurement technique (Ball- Bank Indicator). The 1988 Manual on Uniform Traffic Control Devices (MUTCD)2 was intended to ensure uniform application of traffic control devices nationwide. 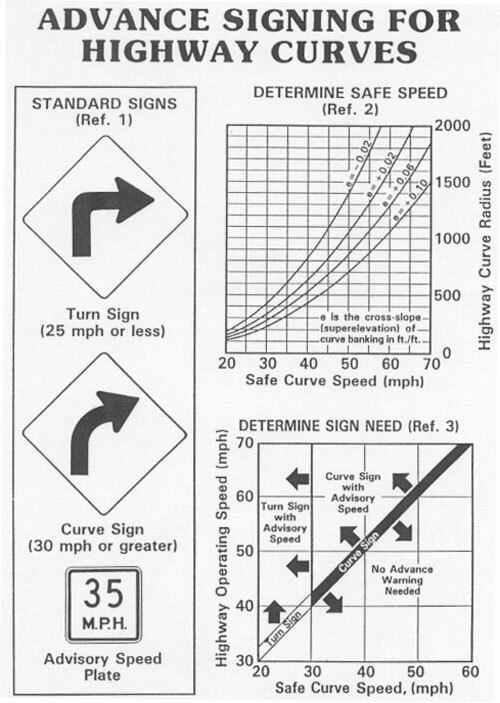 Yet, when it addressed signing for roadway curves, the 1988 MUTCD through its ambiguous and ambivalent language actually promoted widely varying practices. The result of applying this practice was that drivers were sometimes surprised by sharp roadway curves that had no warning at all, and, at other over-signed roadway curves, drivers could easily operate 15-20 mph faster than the advisory speed. For example, some (usually local) agencies failed to sign 20-mph (safe speed)roadway curves hidden over sharp hillcrests on 55-mph roadways, while other (usually State) agencies installed advance warning signs, 50-mph advisory speed plates, and chevron signs at 54-mph (safe speed) roadway curves on 55-mph (speed limit) roadways. The new 2001 MUTCD3 may have slightly improved the application of roadway curve signing. Although it still does not give clear guidance, it does have some new useful signs and does more strongly emphasize the need for engineers to make signing decisions. So the opportunity exists now to develop a more objective engineering basis for making proper and uniform decisions about roadway curve signs. What is needed is a uniform application of signs based on a clear-cut analysis of both the dynamics of vehicle cornering and the human tolerability of drivers to the higher lateral forces generated in cornering. This paper suggests an analytical development of lateral acceleration criteria for determining each application of curve (or turn) warning signs, advisory speed plates, and/or chevrons. The desired result of this analysis is a recommended uniform approach for applying these signs nationwide. Some roadway agencies and/or some of their subdivisions use very few roadway curve signs where they are truly needed, while other agencies and/or their subdivisions use a plethora of signs and unrealistically low advisory speeds where they are not needed. Because the practice of signing roadway curves can vary so much not only between nearby jurisdictions but also within jurisdictions, drivers, on one hand, can lose respect for the signs and, on the other hand, can be surprised by unmarked sharp roadway curves. Those agencies that have definitive warrants for signing roadway curves will have a practice similar to that shown in Figure 1.4,5 This practice avoids any signing when the safe speed equals or exceeds the speed limit, uses an advance warning sign when the safe speed of the road curve is from 10-14 mph below the operating speed of the roadway, and adds an advisory speed plate reflecting the nearest 5-mph speed increment at or below the safe speed when the deviance is 15 mph or greater. The dynamic responses of the vehicle are not linearly related to speed but are clearly related to the square of the speed. Small increases in speed generate large differences in lateral acceleration on sharp roadway curves. Larger increases in speed generate only marginally larger lateral accelerations on flat roadway curves. The underlying consideration in the general practice of roadway curve signing is the factor of safety, or how close drivers will come to generating a lateral acceleration (friction demand) equal to the frictional capability of the tire-pavement interface. The fallacy of this thesis is that almost all drivers cannot even come close to generating this much friction demand in a steady-state turn. What has been missing in this long-standing thought process is what level of friction demand is really critical to most drivers. Studies6,7 have strongly indicated that most drivers cannot emotionally handle lateral accelerations above 0.3 g's. The general practice5 of always rounding advisory speeds down to the nearest 5-mph increment ignores the widely varying sensitivity of lateral acceleration to roadway curvature. While this practice may be sensible for very sharp curves, it makes less sense for flatter curves. Even with warning signs, drivers are reluctant to reduce their speeds for roadway curves until they actual see the need to do so. This behavior may be related to a general lack of respect for signs. Research indicates that all drivers generate their maximum lateral acceleration before full superelevation is reached on most roadway curves8,9. Develop a performance-based practice for applying signs on roadway curves that realistically relates to the safe operation of the roadway curve. Develop a practice for applying signs on roadway curves that consistently uses additional devices and/or messages as roadway curves become more critical. Develop a practice for applying signs on roadway curves that promotes uniform practice in the U.S.. Develop a practice for applying advisory speed signs on roadway curves that neither overstates nor understates the appropriate safe speed. The philosophy promoted here is that, the higher the expected level of friction demand for a combination of roadway curve geometry and vehicle operating speed, the greater the need to communicate to the driver through traffic control devices. In other words, once a design vehicle speed and vehicle path can be related to the roadway curvature, length, and superelevation, a design level of lateral acceleration can be determined for signing that roadway curve. Likewise, a rationale is needed for determining the criticality of various levels of lateral acceleration such that a table similar to Table 1 can be developed. Review the literature about vehicle operations on roadway curves, driver responses to roadway curve warning signs, and human tolerability to lateral acceleration. Determine a criteria base for calculating the expected lateral acceleration to use for setting the appropriate signs for a given roadway curve geometry. a. What is the critical expected speed as a function of speed limit, roadway curvature, curve length, superelevation, etc.? b. What is the critical expected vehicle path as a function of roadway curvature, curve length, superelevation, etc.? c. What is the appropriate percentage of full superelevation as a function of roadway curve geometry? Using the criteria established in Step 2, calculate the friction demand for operating speeds ranging in 5-mph increments from 15-70 mph on roadway curves with safe speeds ranging in 1-mph increments from 15-70 mph. Using these calculations, study the sensitivity of lateral acceleration for various curve geometries for the purpose of develop a precise round-off strategy for advisory speed plates as a function of both roadway curve geometry and the deviance between safe speed and speed limit. Using existing literature about the human tolerability of drivers to lateral acceleration, develop a performance basis for determining when to apply various roadway curve signs. Using these results, develop a tabular or graphical format that tells exactly which signs to use for various combinations of curve geometry and speed limit. Considering the results of Step 6, analyze the accuracy of the Ball-Bank Indicator5 (see Figure 2) in correctly setting the appropriate advisory speed. There is some indication both that this device is not always used properly and also that different criteria are used by some jurisdictions. Because of this potential weakness in the application, perhaps a validity check using measurements of curve length, superelevation, and degree of central angle should be recommended. All of these roadway curve features can be measured easily and used to calculate safe (design) speed. Of course, if as-built plans are available, these features can be taken from the plans. Direct special attention to (a) the rational basis for advance distances for warning signs 3, (b) the general use of delineators3, (c) the use of delineators vs. chevrons for various conditions, (d) what to do differently if a curve is hidden by a sharp crest, (e) what to do differently when a roadway curve has tangent roadway intersections, and (f) whether new innovative traffic control devices have some role in the recommended practice. Prepare a full description of research methods and comprehensive recommendations for the application of roadway curve signs. Fully discuss every step of the development procedure so that the validity and sensitivity of assumptions and/or rational decisions can be scrutinized by potential users of the methodology. 1. Neuman, Timothy R., Glennon, John C., and Saag, James B., Accident Analysis for Highway Curves, Transportation Research Record 923, 1983. 2. Federal Highway Administration, Manual on Uniform Traffic Control Devices, 1988. 3. Federal Highway Administration, Manual on Uniform Traffic Control Devices, 2001. 4. Kansas Department of Transportation, Handbook of Traffic Control Practices for Low Volume Rural Roads, 1991. 5. Federal Highway Administration, Traffic Control Devices Handbook, 1983. 6. Kummer, H. W., and Meyer, W. E., Tentative Skid Resistance Requirements for Main Rural Highways, Highway Research Board, NCHRP Report 37, 1967. 7. Glennon, John C., Neuman, Timothy R., and McHenry, Brian G., Prediction of the Sensitivity of Vehicle Dynamics to Highway Curve Geometrics Using Computer Simulation, Transportation Research Record 923, 1983. 8. Glennon, J. C., Neuman, T. R., and Leisch, J. E., Safety and Operational Considerations for Design of Rural Highway Curves, Federal Highway Administration, 1983. 9. Glennon, John C., and Weaver, Graeme D., Highway Curve Design for Safe Vehicle Operations, Highway Research Record 371, 1972. 10. Glennon, John C., Effect of Alinement on Highway Safety, Transportation Research Board, State of the Art Report 6, 1987. 11. Glennon, John C., and Weaver, Graeme D., The Relationship of Vehicle Paths to Highway Curves, Texas Transportation Institute, Research Report No. 134-5, 1971. 12. Perchonak, K., et. al., Methodology for Reducing the Hazardous Effects of Highway Features and Roadside Objects, Federal Highway Administration, 1978. 13. Messer, C. J., et. al., Highway Geometric Design Consistency Related to Driver Expectancy, Federal Highway Administration, 1981. 14. Taylor, W. C., and Foody, T. J., Curve Delineation and Accidents, Ohio Department of Highways, 1968. 15. Glennon, John C., State of the Art Related to Safety Criteria for Highway Curve Design, Texas Transportation Institute, Research Report No. 134-4, 1969.